He is just 32, looks a lot younger, and already has a few blockbusters to his name -- Deena, Ramana and the latest, Ghajini -- all in Tamil. The unpretentious lad from Kallakurichi town near Salem has made it big from the word go. He has, to date, directed superstars like Ajith, Vijaykanth and Surya. A R Murugadoss is definitely a happy man. Now, none other than Aamir Khan wants to remake Ghajini in Hindi. This comes soon after the Telugu dubbed version was also a super hit. For now, the diminutive Murugadoss is directing megastar Chiranjeevi in Stalin, his first Telugu venture (Ramana was remade in Telugu as Tagore, with Chiranjeevi helmed by V V Vinayak). 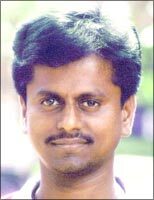 Murugadoss, initially a raconteur who wrote short stories in school and college, now translates his storytelling skills to celluloid. He has, however, not adapted any of his short stories for the big screen so far. In a conversation with Radhika Rajamani, the director talks about his early life, his passion for movies and his career. How's life after the stupendous success of Ghajini? I didn't expect the Telugu version to be such a great hit. When a film releases successfully on the first day, the enjoyment is only for a day. From the second day onwards, I start thinking about whether this success will be sustained over the next few days. We work hard and definitely look forward to a hit. Yes, he has. Pradeep Rawat, who acted in Ghajini, felt the movie should be seen by Aamir Khan. We first sent him a print, then a DVD. Aamir said it was good but, after a few days, surprised me by asking if I could come to Mumbai on a particular date. When I met him, he said he would like to re-do it in Hindi. It will be suitably adapted. I am happy as it will be seen all over the country. Apart from Aamir, however, the rest of the cast has not been decided. We plan to take up that movie (perhaps by the end of the year) after I finish my present project, Stalin. Is Ghajini based on the English film Memento? I had written half the story of Ghajini when I saw Memento. I liked the character in the film who remembers things for just 15 minutes. So, I used just that character. How did you decide to make Stalin? At the time of Tagore (which is a remake of my Tamil Ramana), Chiranjeevi and I decided to do a Telugu film. Which is how the film materialised. What inspired you while writing the story? Some years ago, I had gone to Vijayawada to attend the 100th day function of Chiranjeevi's film Indra and I saw a crowd of 10 lakh there. I was astounded to see one man drawing that kind of crowd. That is the image of Chiranjeevi. This sparked off the idea. Could you talk about Stalin and the rest of the cast? It is based on a real life hero and the crowd. It is a positive approach towards the hero and will have powerful dialogues. I can't reveal more than this. It also stars Sarada, Khushboo and Trisha. Did you feel nervous directing a megastar like Chiranjeevi? Initially, I did. But later, it felt easy. He gave me the freedom to handle him and the movie my way. What made you direct a Telugu movie? Do you feel hindered by the language barrier? I like Andhra, particularly Hyderabad. I see lots of Telugu movies and understand the language quite a bit. If one is well versed in cinematic technique, one can surmount the language barrier. The story and screenplay has been written by me, while the Telugu dialogues are written by the Parachuri brothers. You have tasted success with all three films you have made so far. What, according to you, is the secret of your success? I take a lot of time on the script � generally six months � and don't get distracted by anything while working on it. I go by my conviction. I narrate it to friends and make changes depending on their reactions. In most of my films, my central idea may be fictional or inspired by people, but the scenes are reconstructed from real life � from the people I meet and from what I have read. How did someone from Kallakurichi near Salem, Tamil Nadu, end up as a director? When in school, I was addicted to reading (initially in Tamil and later in English). Sometimes, I would hide a storybook inside a textbook and read. If a teacher were absent, I would narrate stories to other students. Once in a while, I would add my own versions to stories. At times, a full story was told over several free periods, and students would wait to hear them. Subsequently, I began writing short stories. In those days, cinema was the main source of entertainment. I also wished to join the film industry. My father supported me and no one in the family objected. My story writing skills helped in screenplay writing. I applied to the Film and Television Institute of Tamil Nadu, Chennai, but didn't get through. So, I worked as an assistant with writer Kalaimamani and then with S J Suryah and Uday Shankar before starting off on my own. Some years ago, movies were not a respected profession to be in. Now, things are different and educated people are entering the field. Reading books, watching people and movies. I study characters intensely, talk to people and make them talk. So, my characters are out of life, books or movies. For instance, a bachelor friend of mine had adopted five children and that was the inspiration for Ramana. What are the kinds of movies you want to make? I want to make movies with universal subjects that will enable everyone across the country to see them. Therein lies the challenge. If I make a film in Tamil, it can be dubbed into Telugu and re-shot in Hindi (the lip synch would not match in Hindi; it is more or less alright with Telugu). There should not be just technical excellence in the film, but more to it in terms of a story. I think films should have a message. Movies should not be merely for entertainment. They should make viewers think. Yes, that's the work I know and I want to be in.